Download "INDEMNITIES. 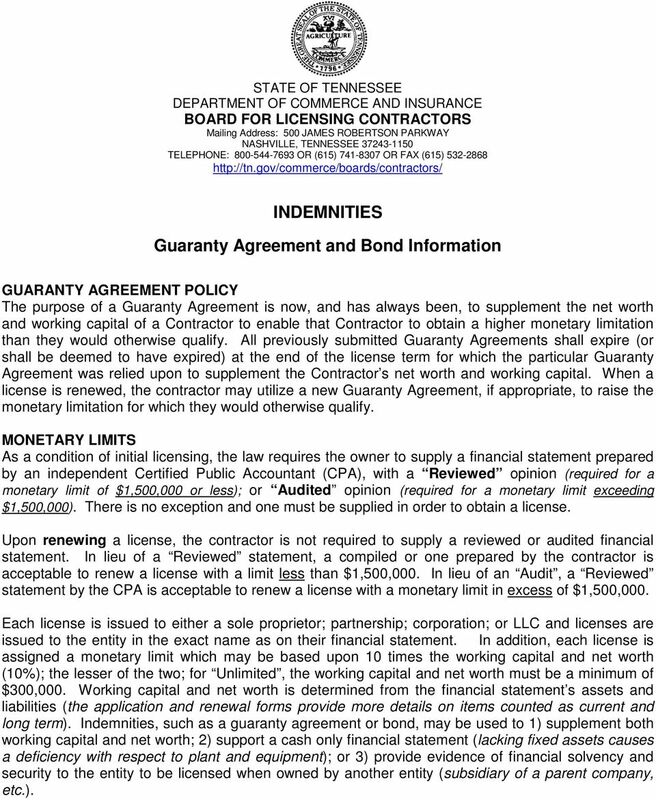 Guaranty Agreement and Bond Information"
1 STATE OF TENNESSEE DEPARTMENT OF COMMERCE AND INSURANCE BOARD FOR LICENSING CONTRACTORS Mailing Address: 500 JAMES ROBERTSON PARKWAY NASHVILLE, TENNESSEE TELEPHONE: OR (615) OR FAX (615) INDEMNITIES Guaranty Agreement and Bond Information GUARANTY AGREEMENT POLICY The purpose of a Guaranty Agreement is now, and has always been, to supplement the net worth and working capital of a Contractor to enable that Contractor to obtain a higher monetary limitation than they would otherwise qualify. All previously submitted Guaranty Agreements shall expire (or shall be deemed to have expired) at the end of the license term for which the particular Guaranty Agreement was relied upon to supplement the Contractor s net worth and working capital. When a license is renewed, the contractor may utilize a new Guaranty Agreement, if appropriate, to raise the monetary limitation for which they would otherwise qualify. MONETARY LIMITS As a condition of initial licensing, the law requires the owner to supply a financial statement prepared by an independent Certified Public Accountant (CPA), with a Reviewed opinion (required for a monetary limit of $1,500,000 or less); or Audited opinion (required for a monetary limit exceeding $1,500,000). There is no exception and one must be supplied in order to obtain a license. Upon renewing a license, the contractor is not required to supply a reviewed or audited financial statement. 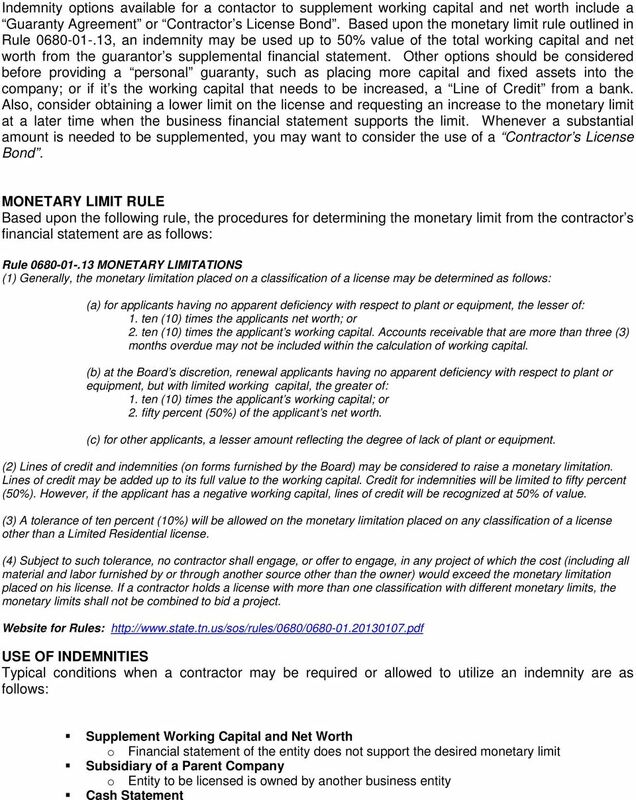 In lieu of a Reviewed statement, a compiled or one prepared by the contractor is acceptable to renew a license with a limit less than $1,500,000. In lieu of an Audit, a Reviewed statement by the CPA is acceptable to renew a license with a monetary limit in excess of $1,500,000. Each license is issued to either a sole proprietor; partnership; corporation; or LLC and licenses are issued to the entity in the exact name as on their financial statement. In addition, each license is assigned a monetary limit which may be based upon 10 times the working capital and net worth (10%); the lesser of the two; for Unlimited, the working capital and net worth must be a minimum of $300,000. Working capital and net worth is determined from the financial statement s assets and liabilities (the application and renewal forms provide more details on items counted as current and long term). 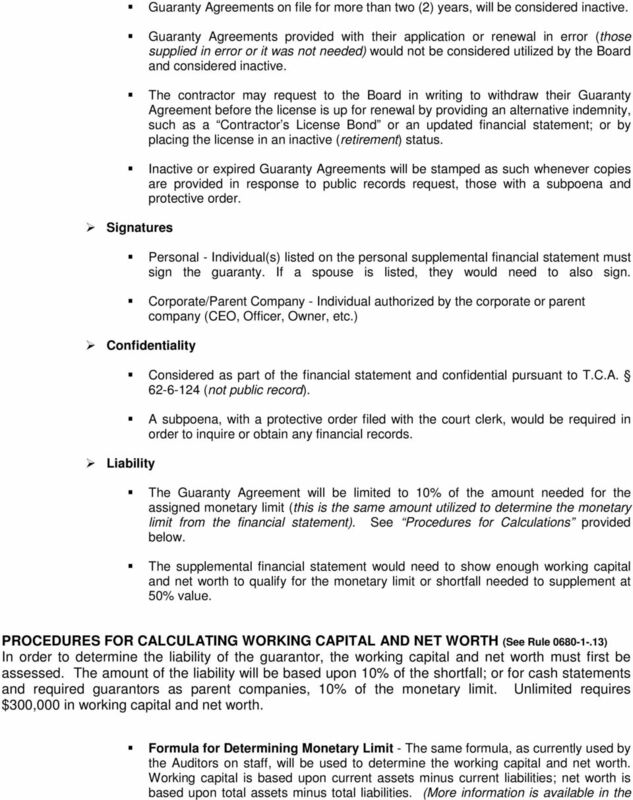 Indemnities, such as a guaranty agreement or bond, may be used to 1) supplement both working capital and net worth; 2) support a cash only financial statement (lacking fixed assets causes a deficiency with respect to plant and equipment); or 3) provide evidence of financial solvency and security to the entity to be licensed when owned by another entity (subsidiary of a parent company, etc.). 3 o Financial statements without fixed assets are those identified in the rule as having a deficiency with respect to plant or equipment GUARANTOR S FINANCIAL STATEMENT The Guaranty Agreement to indemnify your business is a tool that may be used to supplement the working capital and net worth. However, in order for a guaranty to be utilized, the guarantor s supplemental financial statement (personal or parent) must show to be financially solvent enough to cover the shortfall or monetary limit of the entity obtaining the license. There are two (2) types of guarantees: I. 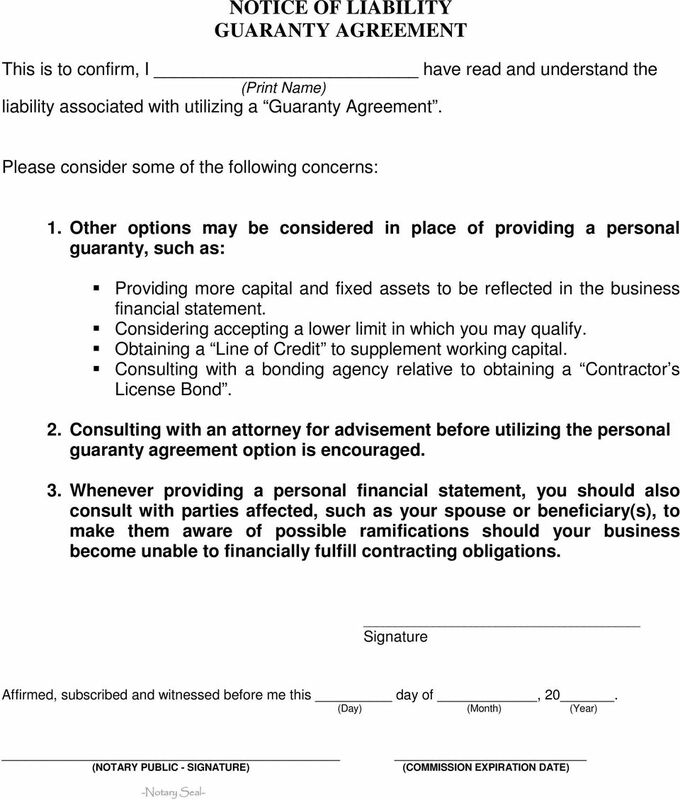 Personal Guaranty Agreement - The Board discourages the use and advises only to consider as a last resort, as these may be considered to fulfill construction related obligations, personally, if not satisfied by the licensed business. It would be best to look into other options, such as having your CPA prepare a review or audit on a business already established; or utilizing a Line of Credit to supplement the working capital; or if feasible, a Contractor s License Bond. 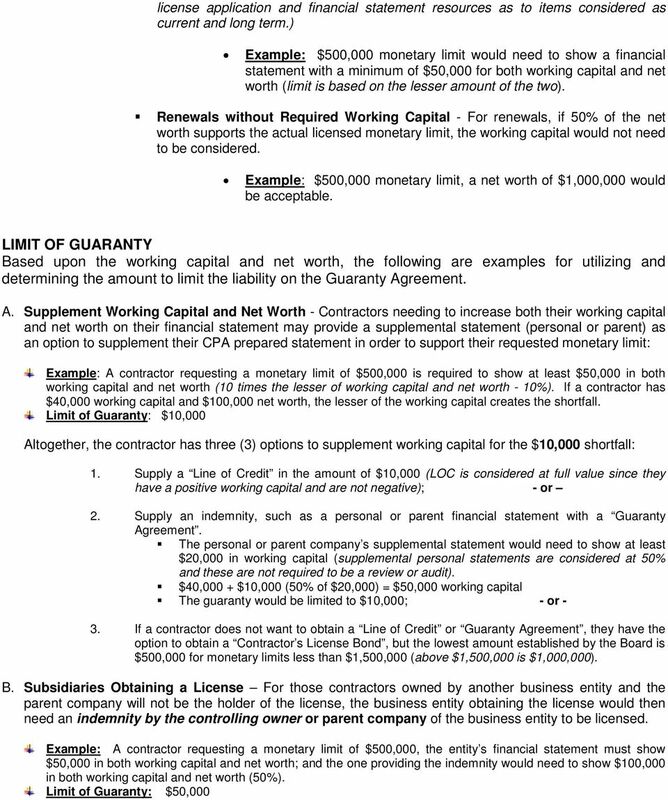 When utilizing a personal guaranty, it must be supplied with a supplemental personal financial statement, which may be a self-prepared (you may use the Board s sample personal balance sheet format attached; or one from a bank; or one developed from your in-house accounting computer software). 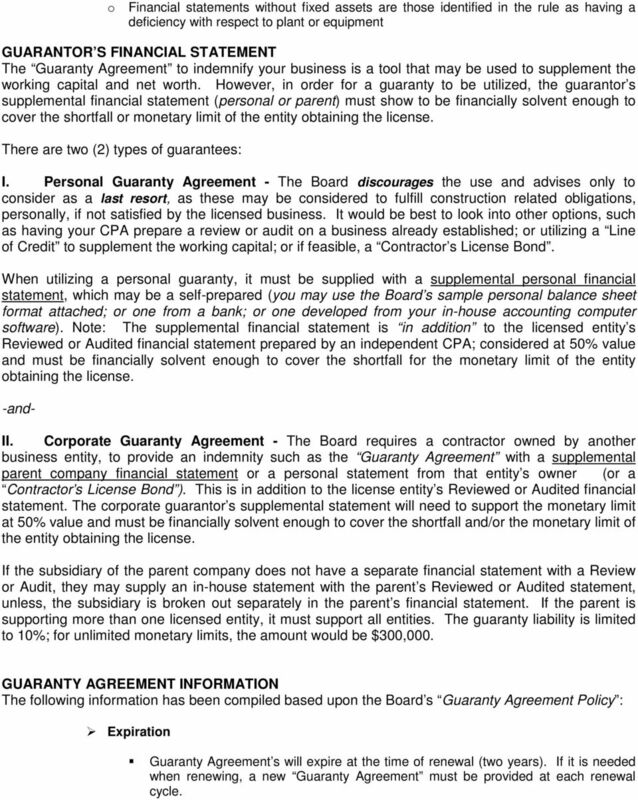 Note: The supplemental financial statement is in addition to the licensed entity s Reviewed or Audited financial statement prepared by an independent CPA; considered at 50% value and must be financially solvent enough to cover the shortfall for the monetary limit of the entity obtaining the license. -and- II. 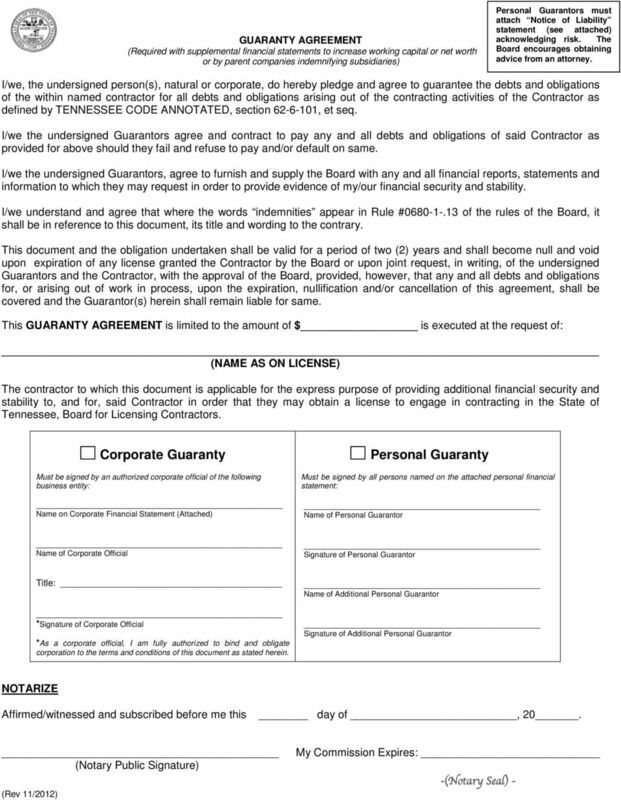 Corporate Guaranty Agreement - The Board requires a contractor owned by another business entity, to provide an indemnity such as the Guaranty Agreement with a supplemental parent company financial statement or a personal statement from that entity s owner (or a Contractor s License Bond ). 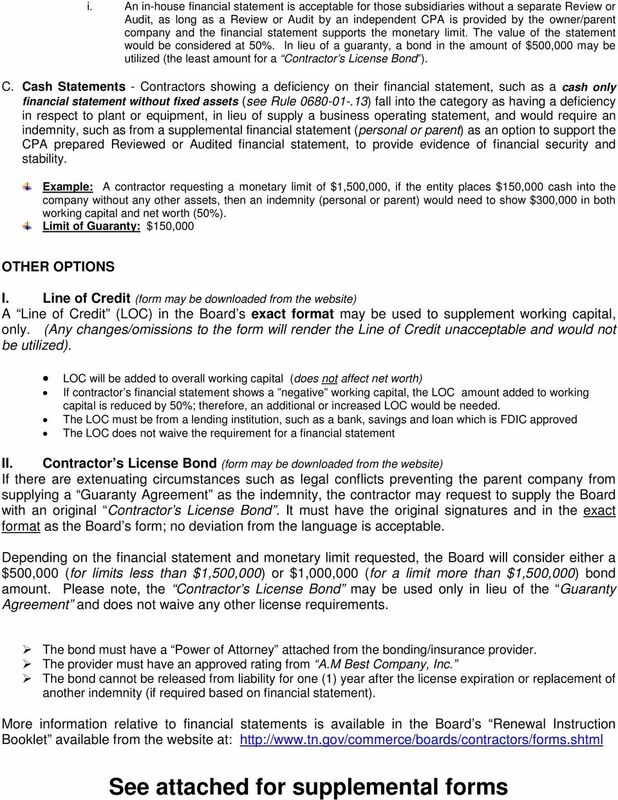 This is in addition to the license entity s Reviewed or Audited financial statement. The corporate guarantor s supplemental statement will need to support the monetary limit at 50% value and must be financially solvent enough to cover the shortfall and/or the monetary limit of the entity obtaining the license. If the subsidiary of the parent company does not have a separate financial statement with a Review or Audit, they may supply an in-house statement with the parent s Reviewed or Audited statement, unless, the subsidiary is broken out separately in the parent s financial statement. If the parent is supporting more than one licensed entity, it must support all entities. The guaranty liability is limited to 10%; for unlimited monetary limits, the amount would be $300,000. GUARANTY AGREEMENT INFORMATION The following information has been compiled based upon the Board s Guaranty Agreement Policy : Expiration Guaranty Agreement s will expire at the time of renewal (two years). If it is needed when renewing, a new Guaranty Agreement must be provided at each renewal cycle. 7 PERSONAL FINANCIAL STATEMENT (Attach Guaranty Agreement) Name: Date: / / Residence Address: City, State & Zip CURRENT ASSETS (Readily Converted to Cash) Cash on Hand & in Banks Savings Accounts IRAs, 401(k) or Other Retirement Accounts Accounts & Notes Receivable Life Insurance (Cash Surrender Value ) Securities, Stocks and Bonds Other Assets Readily Convertible to Cash (List) Dollars Only A TOTAL CURRENT ASSETS NON-CURRENT ASSETS (NOT Readily Converted to Cash) Personal Residence Other Real Estate Owned Personal Property (automobiles, boats, jewelry, etc.) Other Personal Property (household items, jewelry, collections) Accounts & Notes Receivable Other Non-Current Assets (List): ) B TOTAL ASSETS CURRENT LIABILITIES (Due within one (1) Year) Current Debt (credit cards, accounts) Notes Payable (residence, home equity) Other Notes Payable (other real estate) Other Notes Payable (automobiles, boats, etc.) Unpaid Taxes Other Current Liabilites (List) C TOTAL CURRENT LIABILITIES LONG TERM LIABILITIES (NOT due within one (1) Year) Notes Payable (residence, home equity) Other Notes Payable (other real estate owned) Other Notes Payable (automobiles, boats, etc.) 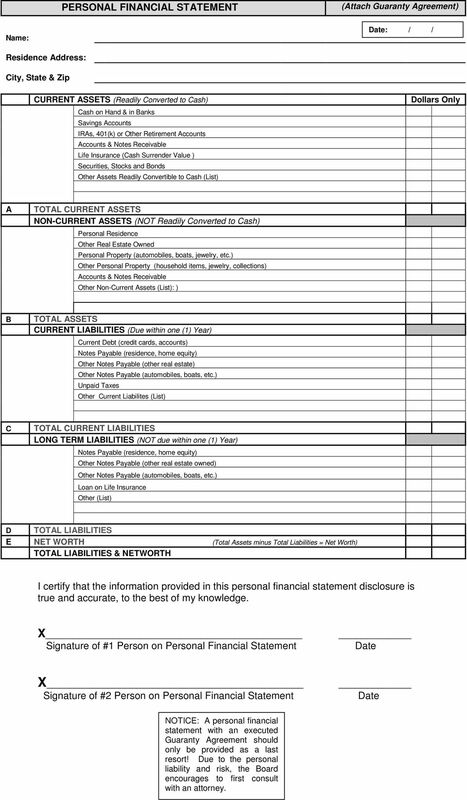 Loan on Life Insurance Other (List) D TOTAL LIABILITIES E NET WORTH (Total Assets minus Total Liabilities = Net Worth) TOTAL LIABILITIES & NETWORTH I certify that the information provided in this personal financial statement disclosure is true and accurate, to the best of my knowledge. X Signature of #1 Person on Personal Financial Statement Date X Signature of #2 Person on Personal Financial Statement Date NOTICE: A personal financial statement with an executed Guaranty Agreement should only be provided as a last resort! Due to the personal liability and risk, the Board encourages to first consult with an attorney. 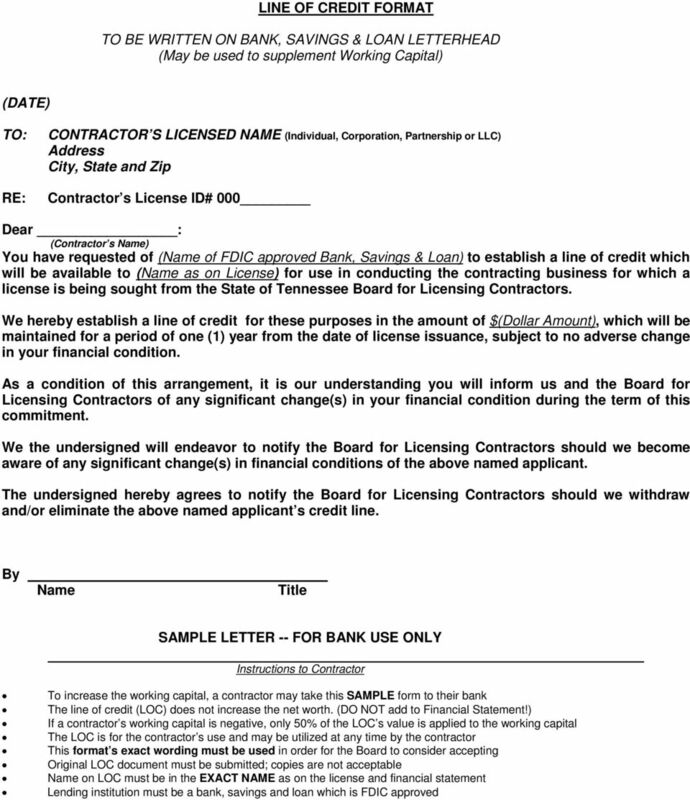 11 Contractor s License Bond Bond No. KNOW ALL MEN BY THESE PRESENTS, THAT we, as Principal and a Corporation, having its principal office in the City of, as Surety, are held and firmly bound unto the State of Tennessee, Department of Commerce and Insurance, Board for Licensing Contractors, Nashville, Tennessee, hereinafter called the Obligee, in the penal sum of five hundred thousand and no/100 ($500,000); OR one million and no/100 ($1,000,000) lawful money of the United States of America to be paid to said Obligee, for which payment well and truly to be made, we bind ourselves, our heirs, executors, administrators, successors and assigns, jointly and severally, firmly by these presents. WHEREAS, a license has been granted by the Obligee to the above bounden Principal authorizing the Principal to practice contracting. 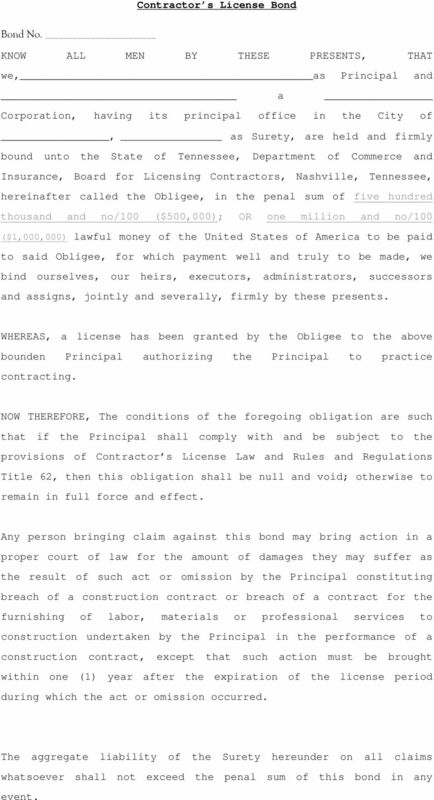 NOW THEREFORE, The conditions of the foregoing obligation are such that if the Principal shall comply with and be subject to the provisions of Contractor s License Law and Rules and Regulations Title 62, then this obligation shall be null and void; otherwise to remain in full force and effect. 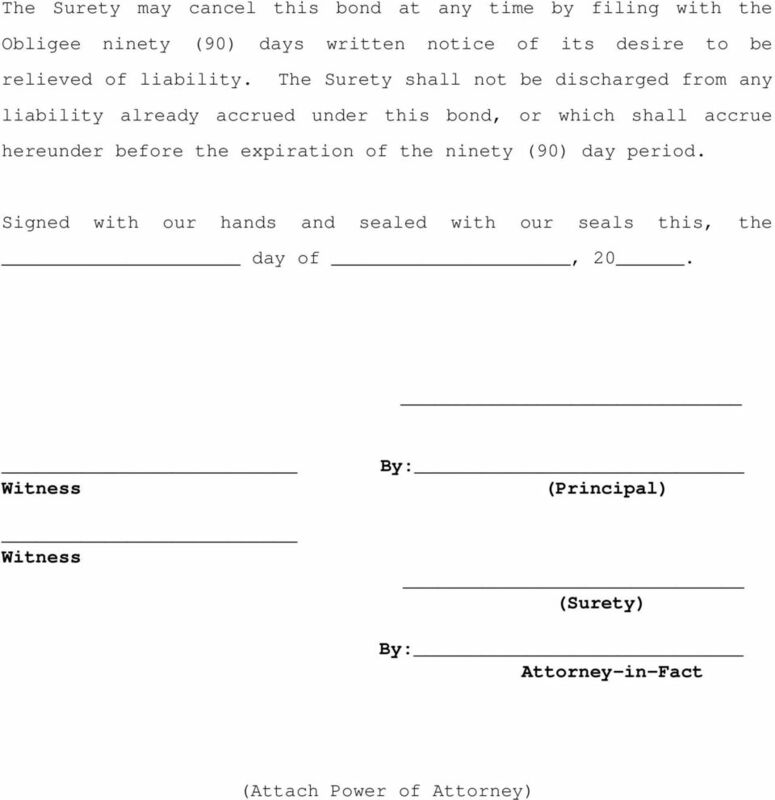 Any person bringing claim against this bond may bring action in a proper court of law for the amount of damages they may suffer as the result of such act or omission by the Principal constituting breach of a construction contract or breach of a contract for the furnishing of labor, materials or professional services to construction undertaken by the Principal in the performance of a construction contract, except that such action must be brought within one (1) year after the expiration of the license period during which the act or omission occurred. The aggregate liability of the Surety hereunder on all claims whatsoever shall not exceed the penal sum of this bond in any event.